Ribbon-cutting with Abby and Howard Milstein. 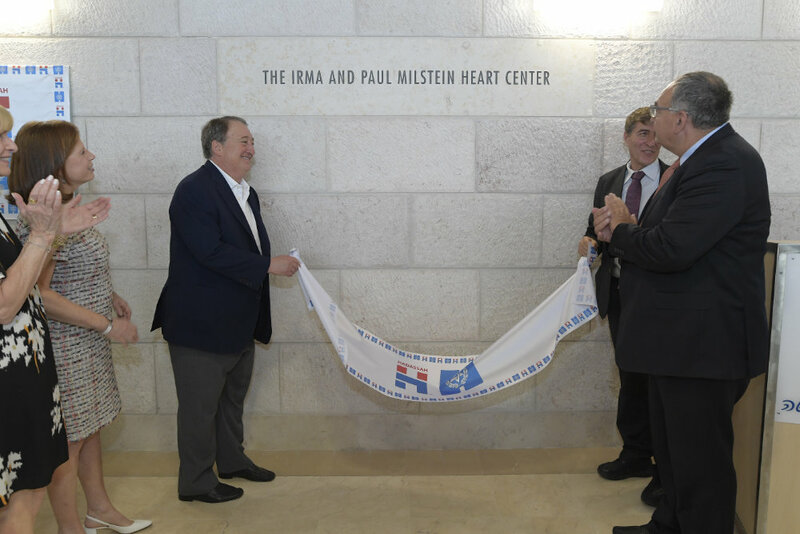 In the presence of Deputy Minister of Health Yaakov Litzman, National President of Hadassah, the Women’s Zionist Organization of America Ellen Hershkin, Director General of Hadassah Hospital Prof Zeev Rotstein, Howard Milstein inaugurated the Irma and Paul Milstein Heart Center in Hadassah Ein Kerem, Jerusalem in honor of his parents. 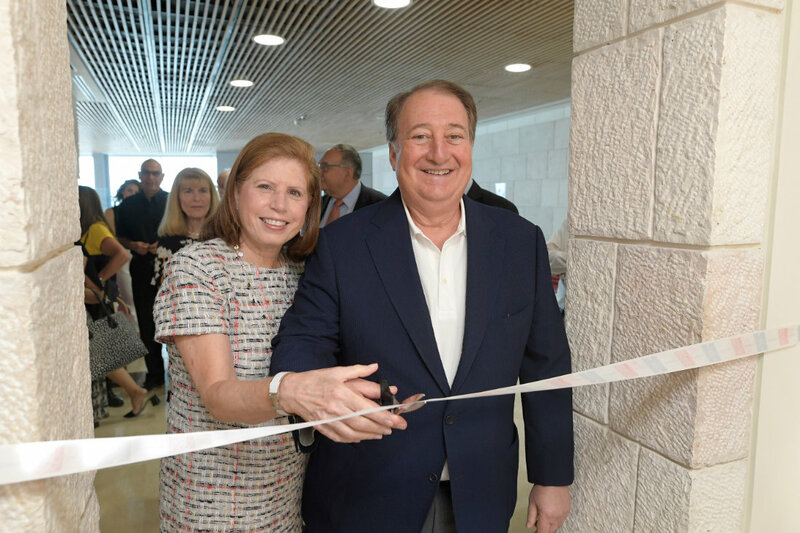 The new center occupies the entire third floor, 4500 square meters, of the Sarah Wetsman Davidson Hospital Tower. It makes use of the world’s most sophisticated medical technology and more than doubles the department’s previous capacity to treat heart patients. This includes 11 intensive care private rooms plus 11 post-catherization beds and another 32 beds in the cardiac ward. Irma Milstein is a member of Hadassah, the Women’s Zionist Organization of America. She and her late husband Paul, from New York, earmarked their ten million dollar donation for the heart center. Giant high resolution screens connected to the imaging equipment display all of the patient’s vital data at once. Researchers at The Rockefeller University have developed an automated technology that combines imaging with digital analysis and machine learning to help physicians detect melanoma at its early stages. This work was supported by the Paul and Irma Milstein Family Foundation, with additional support from American Skin Association, whose chairman is Howard P. Milstein, and the National Institutes of Health. It seems like yesterday, but apparently it was 10 years ago. My family was honored to help return the Museum’s legendary blue whale to a spectacularly renovated home, named in honor of my parents, Irma and Paul Milstein. The grand refurbishment of this legendary gallery was led by my mother, Irma Milstein, a longtime Museum Trustee, and my father, Paul. Inspired by memories of their time with children and grandchildren in the so-called Whale Room, our family became dedicated to keeping this hall and its iconic exhibitions accessible, relevant, and enriching for today’s visitors. We hope that the Milstein Family Hall of Ocean Life continues to awaken a lifelong love of nature, curiosity about science, and enthusiasm for learning in the millions of visitors who pass through its doors each year. We also have collaborated with the Museum in expanding public understanding of science and sustainability through innovative programming that draws connections between the content of the Milstein Family Hall of Ocean Life and relevant areas of active scientific research. Each year, the Hall hosts the Milstein Science Series. These free weekend programs use the extensive resources and exhibits of the Museum to offer families a day of hands-on learning with talks by expert researchers, opportunities to examine specimens from its unparalleled collections, and other activities that make current scientific research accessible to family audiences. The Hall remains one of the most popular destinations for the nearly 500,000 New York City schoolchildren and their teachers who visit the Museum each year. Over the past 10 years, the Milstein Family Hall of Ocean Life has hosted a wide variety of scientific gatherings and conferences. These range from the Urban Advantage Science Expo, where middle-school students from across New York City present their unique scientific investigations, to the recent 2013 Milstein Science Symposium, “Understanding Ecological and Social Resilience in Island Systems.” As with previous Milstein symposia, this one brought together world-class scientists and policy leaders from across the globe to discuss findings and share recommendations on pressing scientific topics. The Hall has also served as a dramatic venue for high-profile gatherings of world leaders and countless celebrations of weddings, birthdays, and anniversaries. On April 9, 2013, Howard Milstein welcomed participants to the American Museum of Natural History’s Milstein Science Symposium 2013. The subject of the Symposium was “Understanding Ecological and Social Resilience in Island Systems: Informing Policy and Sharing Lessons for Management.” The American Museum of Natural History’s Center for Biodiversity and Conservation and its partners organized the three-day symposium that brought together local resource managers, researchers, educators, island leaders, policy makers, and other leading conservation practitioners to present and analyze real-world resilience case studies. Central to the symposium was understanding resilience: the ability of ecological and social systems to absorb, resist, or recover from stressors and adapt to change while maintaining critical ecosystem functions and benefits. Island ecosystems present unique challenges for conservation due to distinctive ecological and evolutionary processes and vulnerability to threats. The Milstein Science Symposium explored case studies that exemplify responses to disturbance of change in order to elucidate patterns and processes that foster resilience. Through sharing lessons learned and fostering networks of island managers who are addressing similar challenges, the symposium deepened manager insight into how to promote the resilience of coastal systems, particularly in tropical small island nations, as well as strengthen networks among island leaders, international scientists, and policy makers, paving the way for ongoing collaboration in the future. The Milstein Science Symposium is proudly sponsored by the Irma and Paul Milstein Family. The Milstein family was recently recognized for its long tradition of philanthropy in New York City by The Real Deal: New York City Real Estate News. In the illustration of the connections between the city’s nonprofit institutions and the real estate community accompanying “The Charity Web,” the Milstein family was given a central position. The Real Deal reporter Leigh Kamping-Carter traces the family’s involvement to the founding of Milstein Properties by Paul and Seymour Milstein, which was the basis for “several family foundations that control tens of millions of dollars in charitable wealth.” Kamping-Carter highlights Irma Milstein’s membership on the board of the American Museum of Natural History, where the Irma and Paul Milstein Family Hall of Ocean Life is located. Paul and Irma’s son, Howard, chairs the boards of the New York Blood Center and American Skin Association and is a member of the boards of Weill Cornell Medical Center and the National September 11 Memorial and Museum. Other family members are represented on the boards of the New York Public Library, the Metropolitan Opera, New York University, and Lincoln Center for the Performing Arts. Construction of Paul Milstein Hall, completed in 2012, was made possible by a grant from the Paul and Irma Milstein Foundation. Architect for the project was Rem Koolhaas and the Office of Metropolitan Architecture. The AIA page devoted to Milstein Hall can be seen here. Paul Milstein Hall of Cornell University’s College of Architecture, Art and Planning (AAP) was the focus of a weekend celebration by alumni, faculty, and students in early March to mark the building’s completion. The highlight of the weekend was a talk on March 9 by internationally renowned architect Rem Koolhaas, who designed Milstein Hall with his Office of Metropolitan Architecture. AAP Dean Kent Kleinman introduced Koolhaas and moderated a Q&A for a capacity audience of nearly 300 in the Abby and Howard Milstein Auditorium and Boardroom. Nearly 500 AAP alumni (a record for a college gathering) were on hand for the weekend’s events, which included an evening dance party on March 10 held in the Sibley Dome and the Milstein Dome, exhibitions by alumni, and a talk on the origins of the Savannah, Georgia, city plan by AAP emeritus professor John Reps and planning professor Michael Tomian. Milstein Hall of Cornell University’s College of Architecture, Art and Planning (AAP) welcomed architecture students to their new studios on August 24, 2011. The studios are set up on the building’s second floor, which contains 25,000 square feet of open space as well as a presentation/critique area where students can show their work. AAP Dean Kent Kleinman said that Milstein Hall “allows a new architecture studio culture to unfold,” and links other AAP buildings in a way that will encourage interactions between the school’s departments. Milstein Hall incorporates numerous sustainable features—a cooling system using water from Cayuga Lake, 41 skylights, radiant floor heat, and a green roof—and is expected to qualify for LEED silver certification. The building was designed by Rem Koolhaas, who received architecture’s top award, the Pritzker Prize, in 2000, and architects from the New York office of his firm, the Office for Metropolitan Architecture. Construction began in August 2009, and a 250-seat auditorium on the first floor will open in October. A walk through of the second floor studios can be seen here. 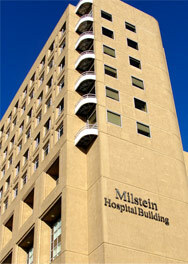 Milstein Hall was named in honor of Paul Milstein by his wife and children. The YIVO Institute launched a new website sponsored by the Milstein Family Foundation and its successor, the PIM foundation. The website, www.milsteinjewisharchives.yivo.org, reflects the work accomplished during YIVO’s three-year, $225,000 pilot project funded by the PIM Foundation and Howard and Abby Milstein Foundation to preserve and document the historic legacy of Jewish New York with emphasis on the histories and archival treasures of five agencies serving the needs of Jewish community in New York.